Height 9 1/2in (24cm). Diameter(of base) 3 1/2in (9cm). Height 7in (18cm). Diameter (of base) 2 1/2in (6.5cm). Height 6in (15cm). Diameter (of base) 2 1/2in (6.5cm). 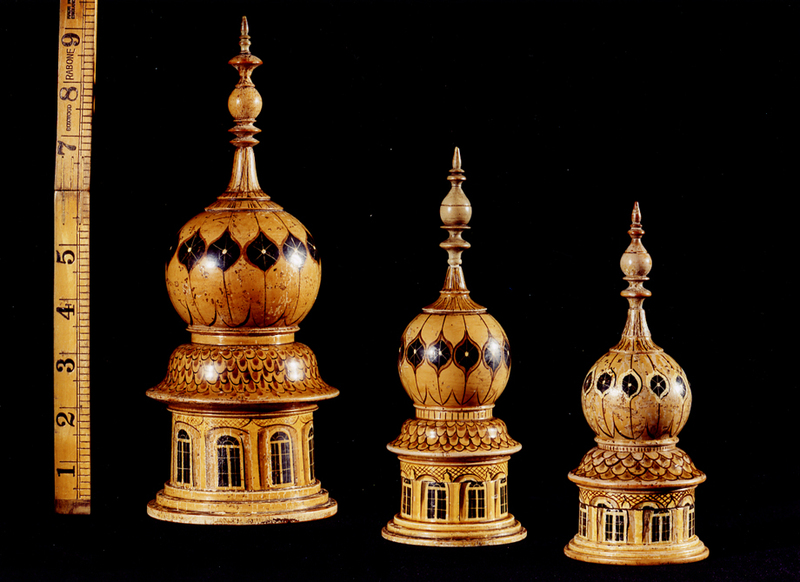 A most unusual collection of THREE Tunbridge ware whitewood and penwork decorated items, comprising two pin cushions and a nutmeg grater, all in the manner of a minaret at the The Royal Pavilion, Brighton, the larger pin cushion unscrewing in the centre to reveal a cushion for pins, the circular base also unscrewing to reveal two original Tunbridge ware cotton reels, the smaller pin cushion unscrewing in the centre AND at the top to reveal two cushions for pins, the smallest item being the nutmeg grater which unscrews at the centre to reveal the metal grater. THE NUTMEG GRATER having a printed label on the bottom of the base ‘YE HARLEQUIN ANTIQUE SHOPPE visited by H.M. The Queen, 16a Kings Road, Brighton’. In 1697, Celia Fiennes (1662-1741) travelled throughout England visiting the newly-created health spas. She noted that at Tunbridge Wells, there were numerous shops offering souvenirs to the fashionable visitors. Amongst these items, were ‘curious wooden ware, which this place is noted for the delecate, neate and thin ware of wood both white and lignum vitae’. This is the earliest known reference to the marketing of such items in Tunbridge so that it was long assumed that these wares were manufactured in the town. However, an earlier reference to Tunbridge has come to light. 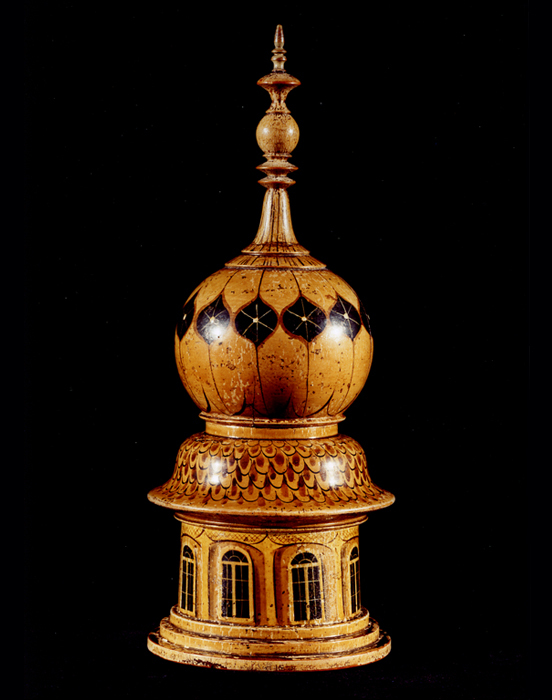 In 1686, Mary Ferguson, a London dealer in small wooden items, petitioned customs officers to release ‘white wood boxes, Tunbridge deskes’ that had been sent to ‘Holland’ to be lacquered and which officials had impounded upon their return. This serves as proof that the industry was also established in London by the 1680s. Apart from London, Tunbridge Wells and Tonbridge, a new production centre arose in the 1820s. Brighton, having received royal patronage from The Dukes of Gloucester and Cumberland and, most importantly, The Prince of Wales, claimed its place amongst the fashionable spar towns. Brighton modeled itself on its neighbour, Tunbridge Wells. 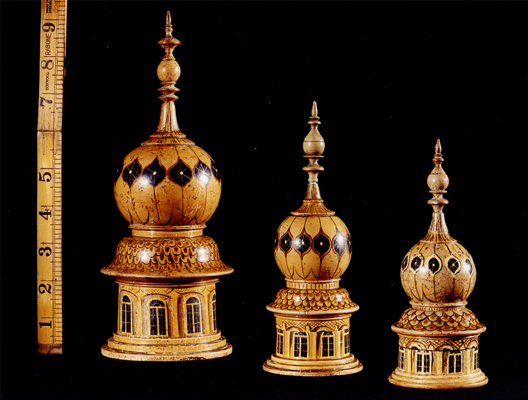 Wooden souvenirs began to be sold in the town’s libraries (of which there were three by 1800). William Upton, John Izard, and the Morris family were the main producers and the local souvenir industry expanded to meet the demands of the rapidly rising number of summer visitors to the town.